I have been in Thailand for a bit more than a week. All of it on the islands in the Gulf of Thailand. Very nice, but not much serious riding. I have been just hanging out with some friends. This morning was different. I got up stupid early. As in, I got to see the sun rise over the ocean at Haad Rin. I got on my bike, heading west. The morning broke hot and humid. I was glad to get the early start because the worst climbs of the day were all in the first couple of miles. The road out of Haad Rin is nuts. A steep winding road. I am used to Seattle hills, but there are a couple of sections marked at 25%. But after that things settled down. I made it to Thong Sala with more than enough time for the 7:00 AM boat. Once I was squared away on the ship I was even able to get some sleep. Which was good as it was a two and a half hour ride. I didn't wake up until we were almost at Donsek. Getting there was amazing. I was impressed before even leaving the boat. The hills in the area look like something out of The Jungle Book. Green forests with limestone cliffs towering over them. And it was like that for most of the day. I kept looking around and seeing more amazing landscapes. Eventually I stopped taking pictures because I never would have gone anywhere. I just kept looking around and being amazed at how gorgeous Thailand is. I also really liked the roads here. They are well paved. I think I saw maybe two potholes. They also have a wide shoulder. The drivers here are also very courteous. No one yells at you. Well, they do, but only to say hello. People love to wave, or smile, or give you a thumbs-up. I haven't yet heard any angry honking either. Mostly people give you a quick “beep-beep” to let you know they are coming by. The people driving here almost totally lack the agression that most people in the US seem to have. I was also getting chased by the wind for most of the day. That helped as well. In the afternoon I was stuck under a dark cloud for an hour. That was fantastic. Getting some shade from the sun really helped. But that couldn't last. Soon enough the clouds started pouring rain and lighting. I stopped to eat and wait out the storm. Though I was doing pretty well, it did get dark on me. I stopped for a bit to get my headlight arranged. It fit very nicely onto my lock which was hanging off the front of my bag. I also put away my sunglasses and put on my clear ones. You might think it is dorky to wear them, but not two minutes later a bug ran smack into them. Not a little bug. This one had some meat on it. So instead of hitting my left eye, it just bounced off with a loud smack. Moments later another bug smacked into my helmet. Then one hit me in the chest and started crawling around. I brushed it off, but that was pretty creepy. Then another one hit my glasses. (Still glad I was wearing them.) What the hell was happening? In my light I could see something about the size of a quarter descending out of the trees. It looked like a brown and white spider lowering itself down on a thread. At that point a car drove by. Its headlights showed hundreds of them in the air. It was a shower of arthropods. Now I can't be sure they were all spiders. Maybe it was just the one I saw. I wasn't about to stick around and check though. When you find yourself in the middle of a biblical plague, you just get the hell out of there. I started jamming down the road as hard as I could. All the while dodging invertebrates like a madman. After a couple of intense minutes it was over. Maybe it was just something that happened right after sunset. Maybe it was just those trees I was under. Either way, it was one of the scariest moments I have ever had on a bike. 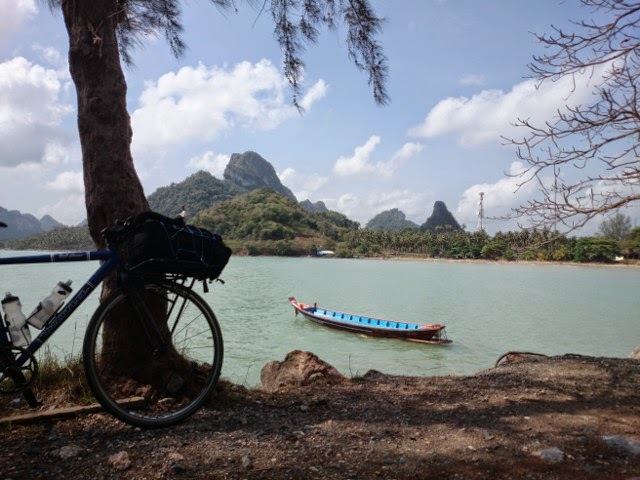 Come and bike Thailand, beautiful landscapes and raining spiders. It took a long time to calm down from that. But I had time. I didn't get into Krabi until almost 9:00 PM. That is a fifteen hour day. I was exhausted. I found a place to check in for the night. I got some food and went to bed.